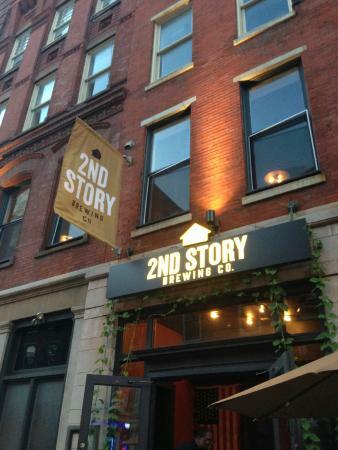 We return to Old City this week to review some of the best bathrooms in the entire city, which are located at 2nd Story Brewing Company. Located in the old Triumph Brewery building, 2nd Story's name is a nod to where the beer is created...the second story, which also hosts an additional bar for when the downstairs gets too crowded. You should have ample opportunities to use their bathrooms, given that they have over 10 2nd Story micro-brews on the menu at any given time, in addition to the usual suspects like Bud Light & Corona. This is the category that 2nd Story excels in. These bathrooms are individually spaced, so you get your own private layer, and there's 12 of them! If you find yourself waiting in line at any point something is wrong. Can’t give 2nd Story anything less than a perfect score for privacy. Euro-style bathrooms where patrons get their own room, complete with sink, entirely to themselves will always earn you a 2/2. This is the only category where 2nd Story can lose any points. They're kind of a victim of their own success here. The privacy is great, but it means there's no way for other patrons to quietly judge messy peoples' behavior. The rooms tend to get a bit out-of-line rather quick, with towels laying on the floor and pee on the seats. The only solution would be to have extra cleaning staff to go through the rooms faster. Ambience is perfect. The rooms are half tile and half deep crimson paint-job, which is a very relaxing color. The lighting is also smooth, none of that psychotic, fluorescent, McDonald's bathroom crap. The door made of frosted glass and there is a cracked window above each door for ventilation. Some friends I was with at the time were complaining about the lack of interesting stuff in the bathroom, like the poster of Irish history at The Bards or any artwork really. Maybe 2nd Story could add some stuff like that, but it's getting 2 out of 2 for intangibles. I docked it a point for cleanliness, but these bathrooms were the closest to a perfect 10 I've ever seen in Philadelphia. Plus, they have paper towels and not hand-dryers. As previously stated, these are the best bathrooms we've reviewed yet. I feel the need to check back to see if the cleanliness situation gets remedied in the future so we can move them up to a 10. We'll see. Take it from the Broad Street Beat though, 2nd Story's beer is awesome and their bathrooms are even better. You'd be doing yourself a disservice not to go give them a try ASAP.